AB-InBev has commissioned a strategic 0,8 km-long high-pressure underground pipeline which allows its SAB Rosslyn branch to have its own filter and metering station to procure natural gas directly from Sasol Gas. HATCH was the project and construction manager, while Energas Technologies was responsible for the E&I, mechanical design, fabrication and supply of the filter and metering skid, as well as the relevant equipment – filter separators, flow meters, insulation joints, and isolation and relief valves. According to Laetitia Jansen van Vuuren, Energas Technologies Product Engineer, the project scope entailed the construction of an 800 m-long high-pressure underground pipeline fed from the existing Sasol transmission network, tying into the newly-constructed AB-InBev filter and metering station. Part of the project also saw the construction of a PSR (Pressure Reduction Station), which was designed and supplied by a separate service provider. Construction and commissioning work took 14 months to complete, with a total of eight principal contractors and CHP suppliers onsite. Peak manpower for contractors was 200. Total project hours totalled 163,842, with zero Lost Time Injury and only two medical treatments recorded – this speaks to the high levels of safety onsite. Another key challenge for the project delivery team was the short timeline within which the project was to be completed. Jansen van Vuuren notes that to design, fabricate and supply the skid-mounted station in less than four months is quite a task, especially considering the long lead items like the filter separators that are sourced from Europe. Experience is the best teacher; having previously undertaken several such projects, Energas rode on its experience to deliver the skid-mounted station within time and budget. 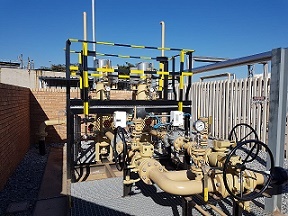 “Energas has been a leading supplier of specialised equipment to the natural gas industry since 2001 and has since acquired extensive experience to provide support and aftersales service for such projects,” says Jansen van Vuuren. “Technical expertise and a wide range of products played a deciding role in the awarding of the contract. The quality of equipment and service we also provide makes us the preferred equipment supplier to existing and new stations,” Laetitia Jansen van Vuuren.